Xiaomi backed firm Black Shark is set to take wraps off its first gaming phone in China tomorrow. While leaked photos of the phone appeared earlier this week, a fresh video leaked on Weibo shows the front and rear design of the device. As per the video, the Black Shark phone will come sporting a bezel-less display with rounded corners. The side bezels are almost non-existent while the top and bottom are pretty thick. There is also a home-screen button that is likely embedded with a fingerprint scanner. The display though looks like a typical 16:9 aspect ratio but AnTuTu listing suggests it will feature a Full HD+ display with 18:9 aspect ratio and a resolution of 2160 x 1080 pixels.The display is also expected to feature high refresh rate similar to Razer Phone. Earlier reports indicated the smartphone would retain some of the core features of the MIUI version of OS. The image confirms the same as the icons are quite similar to that of MIUI, so a customised version of Android 8.0 Oreo is expected. The video also shows the box containing Bluetooth gaming controller that can be attached to the topside of the phone. It will be used for an immersive gaming experience. The back panel sports a unique and sporty design and features horizontally placed dual cameras with LED flash. There is also a big S logo in green on the rear panel hinting the Black Shark brand. Previously it was revealed Black Shark would be powered by Qualcomm Snapdragon 845 chipset paired with 8GB of RAM. There will be two models, one with 6GB of RAM and 64GB of storage and 8GB of RAM and 256GB of storage. Details on the battery capacity remain elusive but with a hefty 4000mAh battery has been speculated. The phone will also be equipped with fast charging technology. Pricing details of the smartphone too are not clear at this point. The Chinese e-retailer JD.com has been listed as the official sales and promotional partner of the Black Shark company. 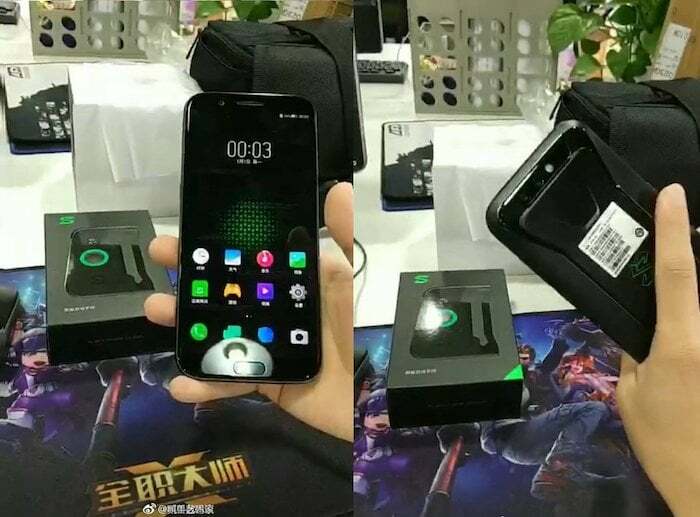 In collaboration with the Chinese website, Xiaomi has already started receiving the reservations of the Black Shark gaming phone. Stay tuned for more updates when the phone is finally unveiled tomorrow. LoL nobody interested in higher priced xiaomi devices LoL again. Typical for cheap chinese brand.